The Saltmen got off to the perfect start in their WMRL Division 1 campaign with a 4-0 victory at Sikh Hunters. The result was maybe harsh on the hosts, who enjoyed plenty of possession but lacked composure in front of goal. 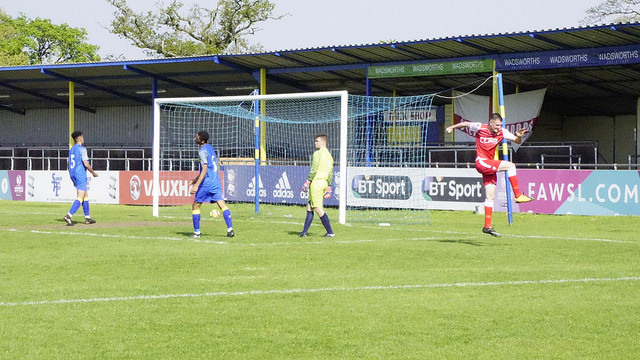 Spa Captain Mike Seeley opened the scoring on just 4 minutes as Haydn Morris's deep free kick found the centre back whose header looped over Liam Haynes in the Hunters goal in to the far corner. Lemon and Burgess had further chances while Jack Allerton was millimetres away from turning in James Lemon's drilled low cross. Hunters' physical style didn't seem to unsettle Spa who looked well organised and defended well throughout. Former Stourbridge striker Justin Nesbitt came closest for the hosts but aside from that, Matty Oliver was seldom troubled during the first half, despite Hunters applying plenty of pressure and enjoying the majority of possession in Droitwich's half. The Saltmen needed to find some composure for the second half, but they came out brightly and doubled their lead within 5 minutes of the re-start - Crowther's cross/shot found its way through to James Lemon, whose powerful close-range drive was well saved by the legs of Haynes, but he could only succeed in helping the ball in to the net. Sikh Hunters were clearly rattled, and a reckless decision by towering centre back Matt Hall to kick out at James Lemon while the front man was already floored saw him receive a straight red card. Hunters then suffered by losing the dangerous Danny Bell who limped off with an ankle injury shortly after and Droitwich took full advantage as they enjoyed their best spell of the game and extended their lead when Lemon got on the end of Andy Crowther's cross. More chances came and went; most notable for Bradley Burgess and substitute Jack Davies who squandered chances when through on goal. The game was up though when Haydn Morris curled in a delightful free kick from 25 yards to put the result beyond doubt. Hunters kept going until the end, and should have registered at least two goals, however matt oliver was in inspired form saving at close range from the lively Hinesh Patel and latterly substitute Dan Jones. An excellent win and all-round good performance from Spa who defended resolutely and were clinical in front of goal. Next up is a trip to Gornal Athletic on Saturday 18 August (ko 3pm).